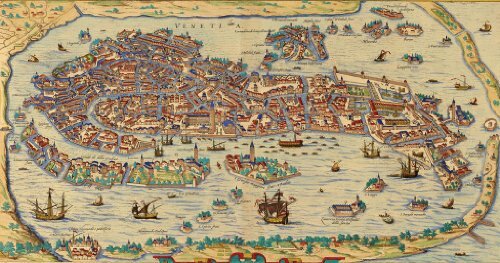 Our newest puzzle is a 16th century map of Venice. I managed to get to Venice once - it was the "low-season" there, which is about 10 days a year in November when the canal bridges ice up. It was wonderfully quiet and mystically romantic. Why aren't all cities like that? According to the Osher Map Library, this is the first map with the word Ghetto marked on it. The Venetian Ghetto was the Jewish neighborhood. The word has come to refer to any segregated neighborhood. Our puzzle will give you that Venetian sense of being just a little lost - almost all the pieces can connect to any other piece. We've thrown in one whimsy to orient you- the lion of St. Mark.